This recipe is from one of the first cookery books I ever bought – the classic Penguin Cookery Book by Bee Nilson. Melt the butter in a saucepan and add the vegetables. Cover and cook gently for about 15 minutes without browning. Shake the pan occasionally to prevent sticking. Add the stock and seasoning and simmer until the vegetable are tender. Liquidise the mixture (I use a stick blender in the pan), add the milk and reheat. Taste for seasoning. Serve with a swirl of cream and some chopped parsley. This quick and easy recipe was given to me by Joan, an ex-colleague who was very fond of Jerusalem artichokes. We’ve got plenty in our veg boxes this week thanks to the Hoare family at Restharrow Farm, Trebetherick in north Cornwall. I have no idea where she got the idea from, possibly Elizabeth David. Boil the artichokes in salted water, straining them before they are quite cooked. Cut them in halves and sauté them gently in a little olive oil with the tomatoes, garlic, and chives and parsley. 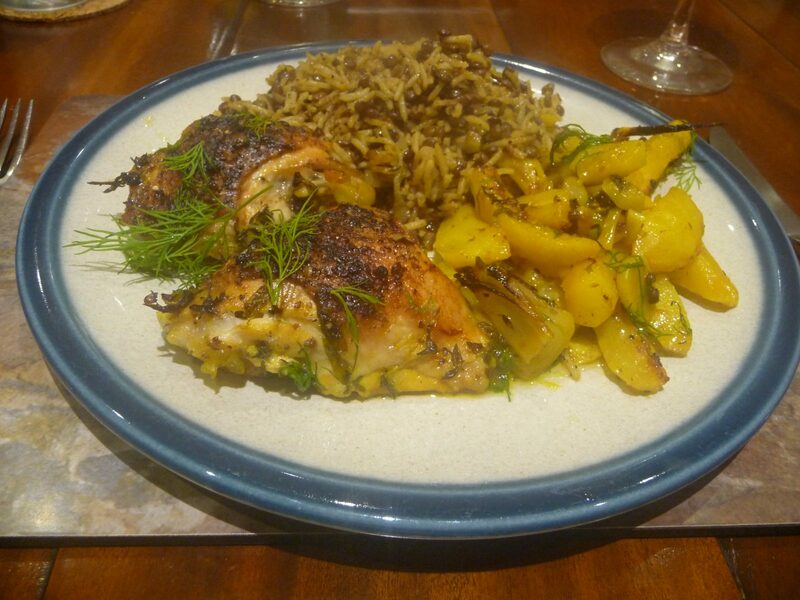 My husband Frank found this recipe from Rosie Sykes’ The Kitchen Revolution on the Low Sizergh Barn website while looking for something new to do with the Jerusalem artichokes in our veg boxes this week. Then, even better, he cooked it for tea last night! If you are ever up in the Lake District, the shop and tearoom at Low Sizergh Barn are well worth a visit. Add 2 tbsp of olive oil and all the butter to a small pan over a low heat. Add half the thyme, and all the lemon zest and garlic. Cover and warm gently. If any butter solids come to the top, skim them off. Set aside until needed. Preheat the oven to 200C/400F/gas mark 6. Toast the hazelnuts in the warming oven for a few minutes until light golden. While warm, wrap in a tea towel and rub them to remove the skins. Once cool, finely chop the nuts. Add the remaining oil to a pan over a medium heat. Add the leeks and thyme leaves stripped from the remaining stalks, cover and cook gently for about 10 minutes until soft. Turn the heat up, add the lemon juice and stir. Let the leeks become pretty dry, season to taste, take off the heat and set aside. Meanwhile, boil the artichokes in salted water for around 3 minutes until soft. Strain and run under cold water. Brush a baking sheet with the infused oil mixture. Lay out one or two sheets of filo to create a 30cm square. Butter the pastry and scatter with a quarter of the hazelnuts, cover with another layer of filo and press down. Repeat to create three more layers on top of the first. Cover the pastry base with soft leeks, then arrange the artichokes on top in overlapping rows. Season and brush with infused oil, crumble the goat’s cheese on top and cook in the oven for 20-25 minutes until the pastry is crisp and the cheese has melted nicely. Cut the tart into quarters. Serve with some bitter leaves dressed with orange. If you don’t know what to do with Jerusalem artichokes try this dish. You need to prepare it ahead of time as it requires at least 2 hours marinating in the fridge though overnight is better. It is taken from Yotam Ottolenghi’s book Jerusalem and he suggests serving it with mejadra, a rice and lentil dish, though this weekend we are going to try it with new potatoes and a green salad. Put the Jerusalem artichokes in a pan, cover with plenty of water and half the lemon juice, Bring to the boil, reduce the heat and simmer for 10-20 minutes, until tender but not soft. Drain and leave to cool. Place the Jerusalem artichokes and all the remaining ingredients, excluding the remaining lemon juice and half the tarragon in a large mixing bowl and use your hands to mix everything together well. Cover and leave to marinate in the fridge overnight, or for at least 2 hours. Preheat the oven to 240°C/ Gas Mark 9. Arrange the chicken pieces, skin-side up in the centre of a roasting tin and spread the remaining ingredients around the chicken. Roast for 30 minutes. Cover the tin with foil and cook for a further 15 minutes. At this point the chicken should be completely cooked. Remove from the oven and add the reserved tarragon and lemon juice. Stir well, season to taste and serve. 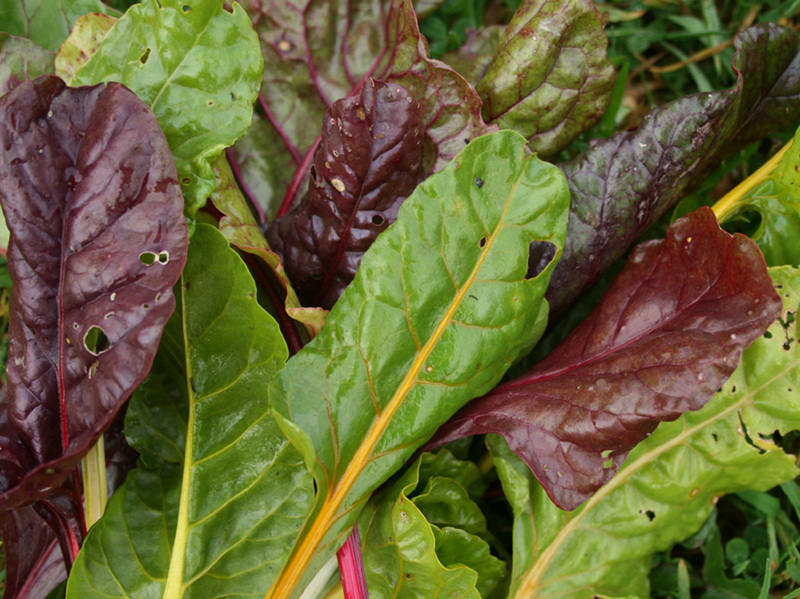 Our first vegetable boxes of 2015 are full of fresh winter variety. Western Morning News columnist Gillian Molesworth has got it in for the humble Jerusalem artichoke. They leer at me from their growing colony in the refrigerator. I’ve roast them, I’ve souped them, I’ve shredded them. My family has suffered digestive consequences. No one will touch them now, no matter what I do. Gillian is one of Camel CSA’s loyal weekly veg box customers. It’s not as if she’s stuck for a recipe for artichokes. It’s just that she’s had enough. Well, I’ve got bad news for her: we’ve just planted a large bed of them as a windbreak (!) for our soft fruit area. In the meantime I suggest she puts her unwanted artichokes on the compost heap along with the swedes that are piling up in her veg rack. Unless she wants to try them raw? But I hope she resists the temptation to buy out-of-season vegetables that have been flown halfway around the world. 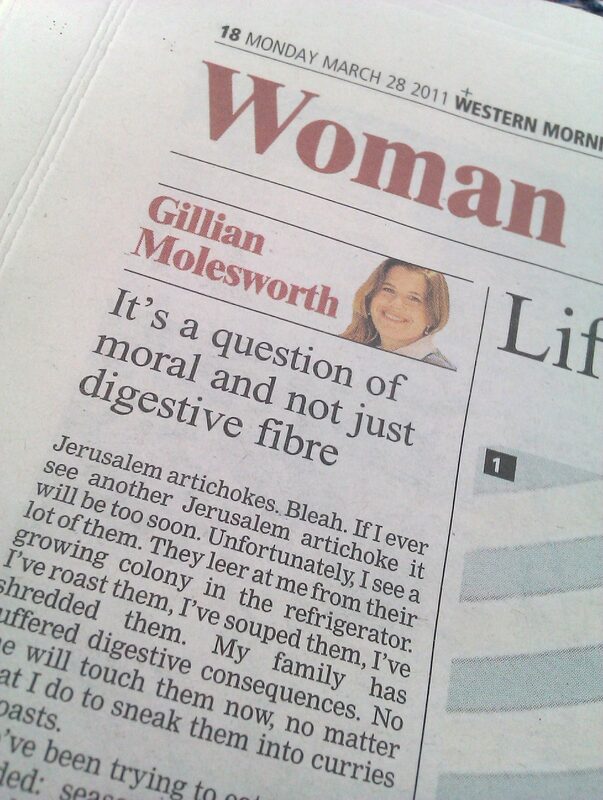 As Gillian concludes, what we eat is a question of moral and not just digestive fibre. Stuck for a recipe idea for Jerusalem artichokes? 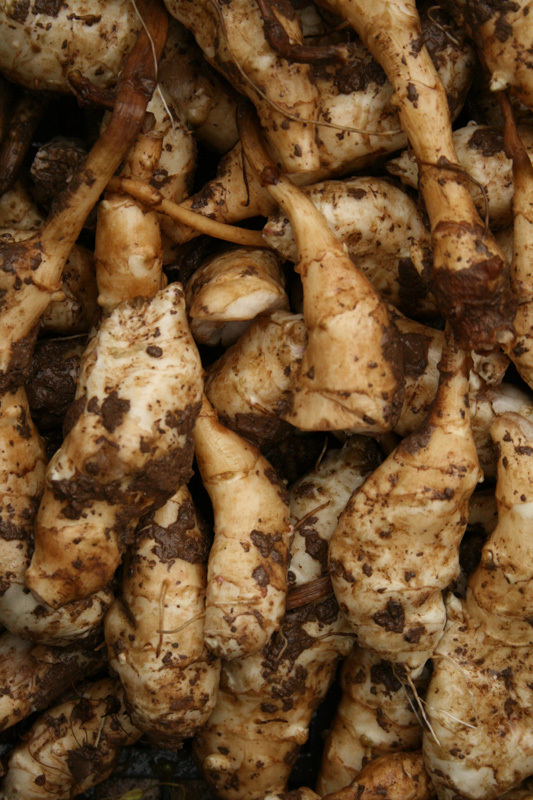 Jerusalem artichokes are a staple item in Camel Community Supported Agriculture’s weekly veg boxes at this time of year. Unlike late winter brassicas, which are in short supply all over the UK, these knobbly roots seem to thrive in hard, frosty conditions. Our growing team are about to plant a new permanent bed of them to sustain us in future seasons. Jerusalem artichokes are hardy perennials, related to sunflowers. They have attractive purple flowers and tall summer growth, so we’ll be using them as a windbreak (!) for our soft fruit area. Camel CSA’s valiant volunteer picking and packing team dig up quantities of them and scrub them clean each week for the boxes – to accompanying groans from some of our members. 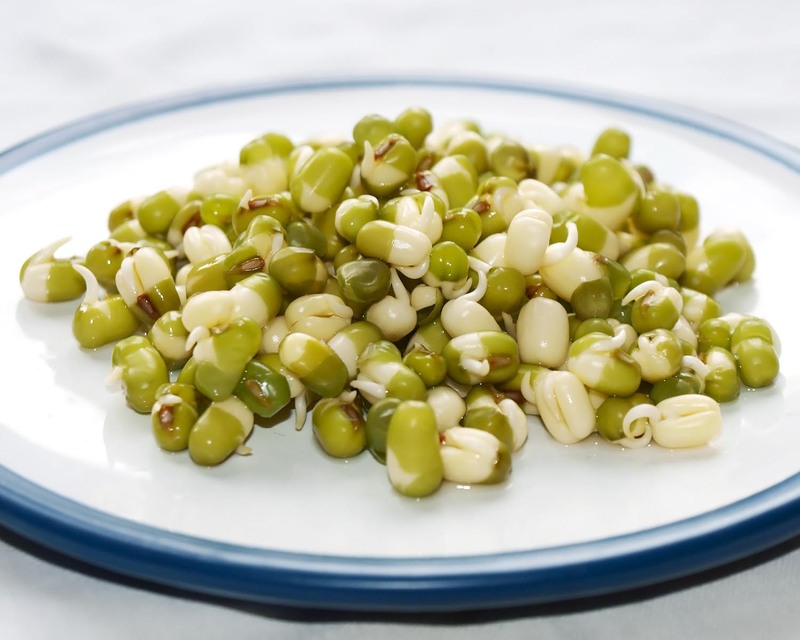 So what can you do with these often-neglected vegetables? My perennial favourite is Jane Grigson’s Palestine Soup, though this is a bit of a misnomer. Veggies should leave the bacon out. 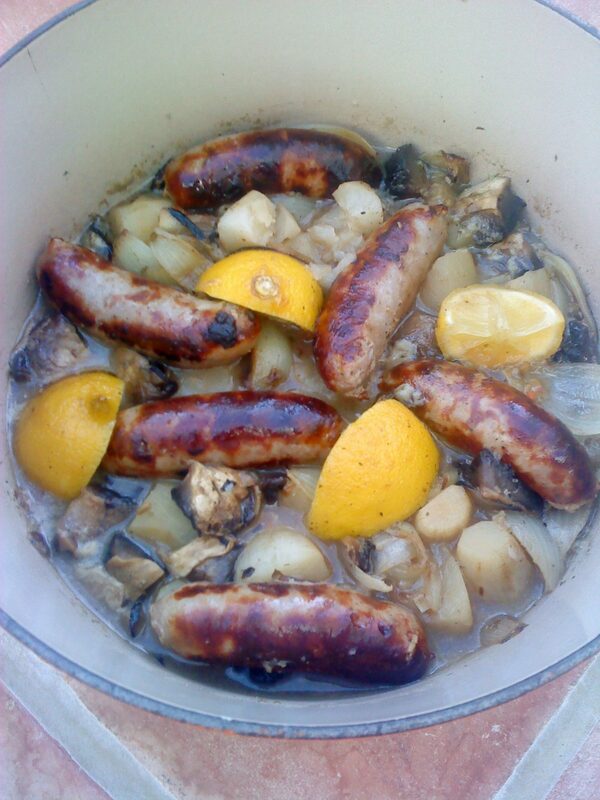 My family also like Nigel Slater’s casserole of artichokes and pork for deepest winter, which uses sausages. It sounds a bit odd but is a surprisingly good heartwarmer on a cold frosty evening. The vegetarians among you could try Yotam Ottolenghi’s artichoke and goat’s cheese souffle or Hugh Fearnley-Whittingstall’s Roast Jerusalem artichoke, hazelnut and goat’s cheese salad. So give Jerusalem artichokes a try. They’re flavoursome, versatile, easy to grow, should be local (if you’re living in the UK) and inexpensive. But be warned – a little goes a long way. The gentle, smoky flavour of this heart-warming recipe by Nigel Slater comes from the Jerusalem artichokes. It’s a perfect antidote to the cold winter weather we’re having in Cornwall at the moment. Find it in his cookbook Tender Volume 1. Brown the sausages all over in a little oil in a deep casserole. Set aside. Peel the onions and cut them into thick segments, then add to the pan in which you browned the sausages, pouring in a little more oil if you need to. Let the onions soften over a moderate heat till they are tender enough to crush with a wooden spoon. Don’t hurry this; it should take about 15 to 20 minutes. Peel and finely slice the garlic and add it to the onions. Halve the mushrooms and add them too. Peel or simply scrub the artichokes, then cut them in half. Add them to the pan, pushing the onions aside, and let them colour slightly. Now tip the sausages back into the pan. Cut the lemon into fat chunks and tuck them in along with the fennel seeds and a good seasoning of salt and black pepper. Pour over enough stock or water to cover and bring to the boil. Turn the heat down and simmer for about 30 minutes, until the vegetables are truly tender. If there is too much liquid, turn up the heat and let it reduce a little. Stir in the parsley, check the seasoning and eat with the greens. 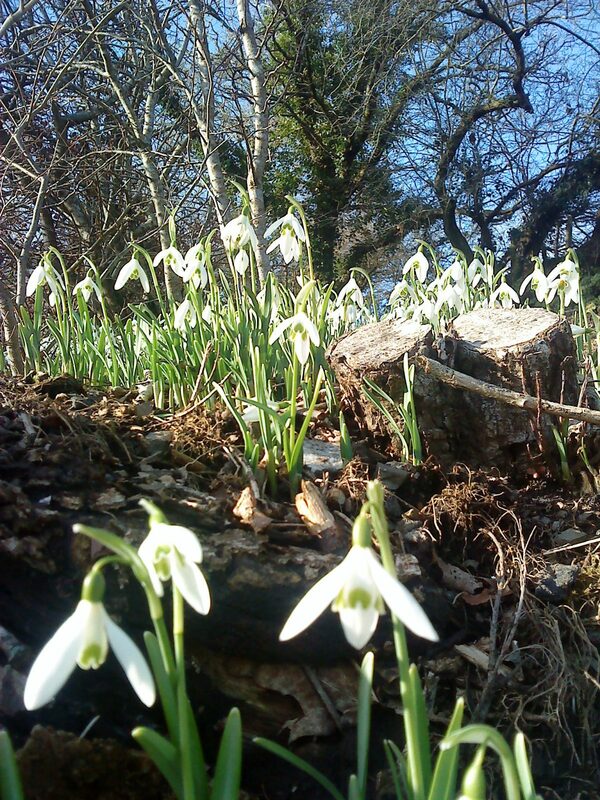 What a relief to see snowdrops emerging in the woods between St Mabyn and St Kew Highway. 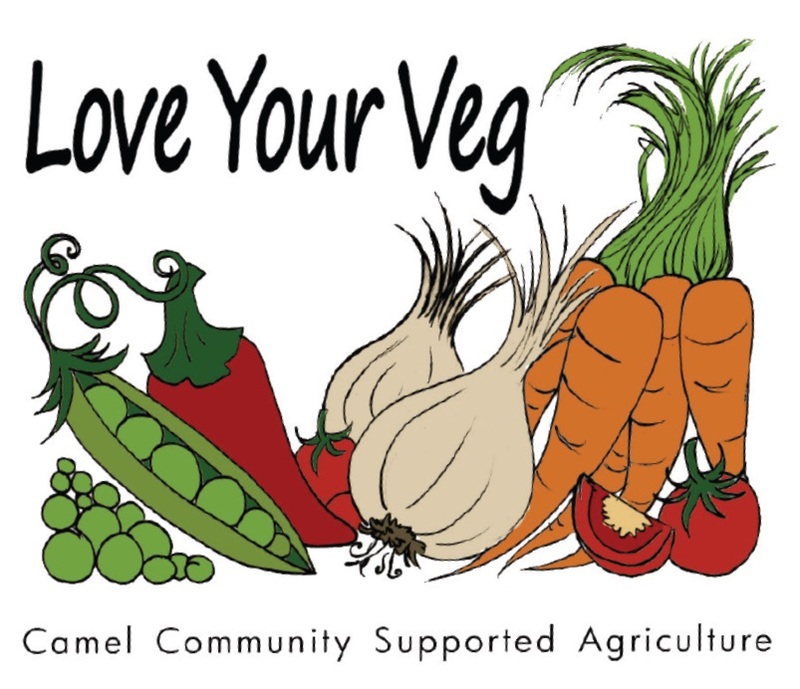 The ground is far too cold and saturated with melted ice and snow for us to start work yet on Camel Community Supported Agriculture’s vegetable plot. Once the earth warms up in late February / early March our volunteer growing team can begin preparing the ground, spreading compost and planting seed into cells to go in the polytunnel. In the meantime we’re continuing to harvest our own parsnips, Jerusalem artichokes and carrots as well as the remaining onions and shallots in store. The rest of the weekly veg box contents are being sourced locally from growers in the immediate area. A first appearance for our own Camel CSA Jerusalem artichokes. Contrarily, they’re neither artichoke nor from Jerusalem but a sunflower, originally named girasole after the Italian for sunflower and that name morphed into Jerusalem. Their supposed similarity in taste to artichoke gave them the rest of their name.